Newbie bloggers used to search; What should you not do when starting a blog? Beginner blogging mistakes to avoid? How can I get better at blogging for beginners? What makes a successful blogger? How do you write a blog for beginners? Driving organic traffic, then converting visitors into readers and regularly keeping the readers engaged with your blog is a great challenge. Building a trust is crucial in a case to live longer in the blogging profession. And the trust comes only by offering the quality blog contents without any mistake. Always try to write error-free blogs that can help you to create trust with your audience. There are certain mistakes that most of the blogger make while blogging professionally. Such mistakes could ruin the chances of becoming a successful blogger. From the lessons I’ve learned from 10 years of blogging, the blog statistics shows that these blogging mistakes take you down in search rankings. So I recommend you to avoid blogging mistakes and rather insist you to try to learn from mistakes especially if you're new to blogging. There are no online blogging classes so for better you can keep on reading the beginners guide to blogging for improving blogging quality. You can even go through other bloggers post & best business blog sites to learn several new things. This will also help you to improve your blog quality including from choosing the blogging topics for beginners, blog pictures, blog news, guest blog, then up to on-page SEO mistakes that most of the bloggers make. The business blogs such as fashion blog, photography blogs are most affected blogs because of the basic and most common blogging mistakes their developers make. 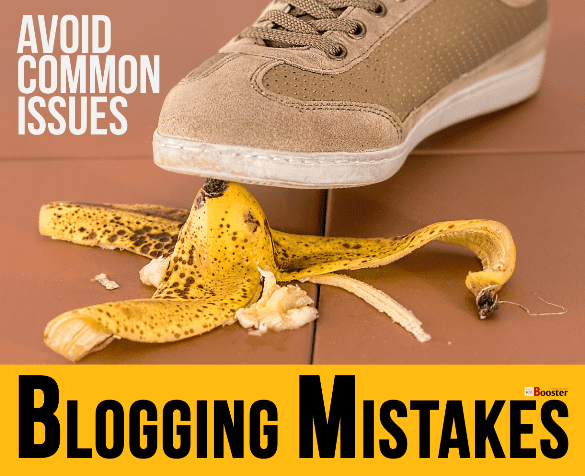 Let's check out most common but biggest blogging mistakes you MUST avoid while making money blogging. 15 Biggest blogging mistakes to avoid. There are several silly mistakes to avoid from writing to marketing a blog post. Here are we listed the most common blogging mistakes a blogger make. As far as possible you must avoid these mistakes. Overcome such faults and make your blogs error-free. By correcting your mistakes, you can improve your blog’s quality then search ranking and so improve the domain authority. This way you can connect to the new readers and make them engage with your site. At the same point, you can keep the old readers returning to your blog posts. Ultimately make you get higher page views, more organic visits, higher ranking so higher revenue. Often, it is observed that professional bloggers write multiple posts, and sometimes they might end by making it slightly complicated. The complex posts are hard to understand. So, focus on avoiding complex writing. Keep your blog's content easy to understand. Make it more interpreting by telling stories in easy words. Use simple words for writing blog pages and appreciate the time of the reader spends on your site. The quality content and easy to understand by one-time reading makes your visitor to a reader. 2. Avoid counting words of a blog post. No doubt, you write for the website. And most often you are restricted with the word count. Still, I must say, avoid blog writing to achieve a particular word count. Look for the quality of the blog and not the quantity of the words. The importance should be given on communicating a message with its full depth. Always try to write according to the reader's point of view and not to the search engines. 3. Not writing in plain English. Again, you should use simple English in your blog post. Replace your long and hard words with more mere words. Make your post clear to get the idea you writing about. Just think that you are writing for a schoolboy. Avoid writing hard words, as it can take a lot of time of the reader to understand the thing. Know the value the time of your readers. Always keep in mind to design your blog post in simple plain English. 4. Avoid addressing a crowd. It's the most common blogging mistake that most of the bloggers make to addressing the crowd. Writing for thousands of readers may sound great, but can ruin the quality of your blog post. If you are not aware of the kind of audience you can have, the blog post becomes generic. With this, you end up speaking with no one. Better to concentrate on the single kind of audience. Instead of focusing a crowd, first, confirm the kind of audience you need to target for. Consider different things those can help your readers through your blog post. Try to make your post more personal. This will definitely have a greater impact on the quality of the blog post. Make it more conversational and engaging. 5. Avoid writing out-of-syllabus content. Often, the bloggers write too much that does not relate to the topic he is talking about. They use to add several things those are not at all concerned about the subject. Such blog posts are meaningless. Avoid writing such posts. Try to focus on your topic. Add images, stories that co-relate with your topic. This is the biggest mistake the blogger make. They share their posts without letting their personality shine through. Try to make it more unique and more generous. You can share your experience to guide your readers. Also, you can pick different images for your blog post. You can even develop your own blogging voice to guide your subscribers. Note that, Google loves original, unique content to get you higher rankings. 7. Avoid writing for yourself. Readers need solutions, and for this, they read your blog. If your blog is written for yourself, how readers can find it useful for them? Try to write the things as you are the reader. Provide them each and every information they can use through your blog. The problem-solving pages make a good impact and help to build trust amongst the users. You must decide Blog vs. Website: Which One Should Be Considered For Your Business? 8. Avoid writing the longer sentences. Writing too long sentence may break the reader’s attention. Even big paragraphs can destroy the quality of the post. Almost all the readers like to read short and friendly sentences and paragraph. Instead of writing a long sentence, break it in two or more sentence. Focus on a single point per paragraph. Put break for paragraphs and make it more appealing. You can use headings, sub-headings, bulleted points to make it more likable. 9. Fail to promote blog content. One of the big mistakes the blogger make is they write the blog but do not promote. Though the blog writing is excellent, it needs to be promoted. Note that, people will not come to your site and for your high-quality content accidentally. You need to take some efforts and make it available for your audience. 10. Not joining the blog communities. Just writing and publishing the content online is not enough. You should join the blog community. This will help to accelerate your blog’s growth. Joining the blog community offers you a wider social circle and an additional portion of the audience. Try to get connected with similar kind of blogs and authors this will definitely help to improve your organic traffic. 11. Failed to interlink posts. Very often, the bloggers need to link their older blog posts while posting a new blog post. It is always recommended to find out related blogs and post links to your current blog post. This will not only help the reader to find relevant content but also make the search engine to crawl your site quickly. Interlinking contribute to improving page ranking. 12. No targeted keyword-rich content. Creative writing is always effective. But if you want to make it visible to your readers, you should not avoid the importance of keywords. The targeted LSI Keywords are the keys that can help your blog post appear on the search engine. Try to find quality keywords that can relate to your blog post and make a habit of using those long tail keywords while writing your blog contents. 13. Not focusing the onpage SEO. The writers those do not focus writing the SEO-friendly posts, do not get desired results in search rankings. Google regularly updating its algorithm. You must follow on-page SEO techniques. Along with SEO-friendly themes, try to make your blog post SEO-friendly. Take into consideration all the things the SEO needs in your blog post. 14. Avoid covering too many topics. This is one of the largest blogging mistakes that can ruin the blog’s quality. Try to concentrate on a single topic per blog. You can write different pages for different topics. Break long content into small parts and publish them into several pages. This will help you to get more page views and better understandable for your regular readers. The blog posts without images possess less value. One image is nothing but 100 words. Images make the reader understand your views quickly. Try to add images and photos along with the caption to make your blog interesting. In SEO perspective, the caption is necessary to know the subject of the page. Quality content with related images makes a great impact to keep your reader engage with your site. Blogging is an art and should always be mistake-free. You should always consider writing error-free blog posts. Especially, when you are building a trust with your audience, you should be perfect in writing. You should take every effort to make your blog reader-friendly. Avoid all common blogging mistakes at all costs. You should build a trust with your audience by offering them quality blogs. Make your readers read more and more your blog posts. With your quality blog post, you should create a concrete structure of permanent readers of your blog. And this can be achieved only by offering error-free, top-quality blog posts.